in flight, originally uploaded by jahansell. 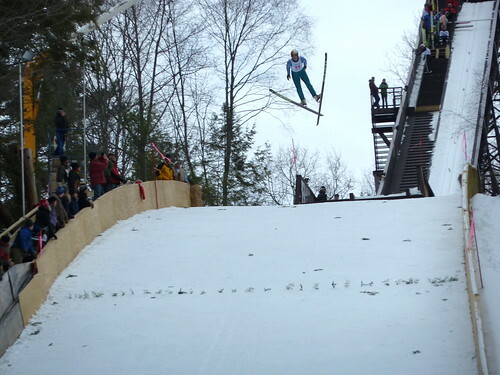 The Ski jumps went off this weekend, and the new jump that SWSA has built is spectacular. I haven't been there in a few years, but the crowds definitely seemed bigger! I wonder if the public will be able to come see the junior olympics? There's not much space there and I imagine it will be pretty full of athletes, families, press, etc! Well captured, with the jumper so clearly visible against the sky. Well done! I hope he got his left ski under control. Can you tell us more about the hill, size and everything? DH, the jump is owned by the Salisbury Winter Sports Association. It's 65 meters high, first built in about 1927 and completely rebuilt to modern specs this year. For more information, visit their website, http://www.jumpfest.org.